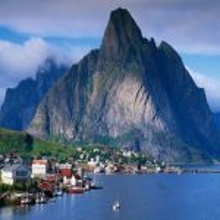 Nordic Saga Tours offers an exciting tour to Norway, better known as our “Norway in a Nutshell” tour, which brings you through Norway in the most thrilling and interesting ways. This is one of our most popular tours, as you’re able to see sights such as the Flåm Railway, the UNESCO fjords, the Stalheimskleiva where you will hug its steep, sweeping curves, the Bergen Railway, the Aurlandsfjord, and much, much more! On the round tour, you have the option of starting in Bergen, Oslo, Flam, or Voss, and because the tour runs every day, all year long, finding a date that works best for you is easy and hassle-free. You can also customize your tour by adding different activities, stops, and hotels along the way. Go glacier hiking, kayaking, or even head out on a safari to see the UNESCO fjords up close! Travel by train, boat, bus, or on foot as you take in Norway’s exquisite scenery and towering landscapes. For even more information or to book your trip to Norway today, don’t hesitate to give us a call! Helpful, experienced travel agents are waiting to talk to you. We want to make your trip to Scandinavia an unforgettable and truly remarkable experience. Read some of our testimonials from happy customers who enjoyed their Norway in a Nutshell tour! Just wanted to send you a quick note to thank you for the fantastic trip to Scandinavia you put together for my mom and I. We thoroughly enjoyed ourselves and the arrangements and hotel choices you made on our behalf were outstanding. We appreciated the simplicity of the transportation, transfers, finding our hotels, the Norway in a Nutshell portion, etc. We had a great time and much of it was due to the ease of travel due to the plans you made. We will definitely reach out to you for future travel and happily recommend your services to friends and family. THANK YOU!! Tremendous trip! Thank you so much for all your help planning our 3-week long independent trip to Sweden, Norway, and Iceland. We have many good memories and pictures of the cities and small towns we visited and the spectacular countryside, mountains, lakes, glaciers, geysers, and geothermal lagoons along the way! Thank you again for all your hard work planning and scheduling our trip. We had a wonderful time! I just wanted to let you know that my nephew and I had a wonderful time in Bergen. The Norway in a Nutshell trip was wonderful. We were really lucky and had sunny days in Bergen and on the Nutshell trip. The Hotel Augustin was very nice and I would recommend it to people. We were only about 2 blocks from where the Express Boat docks and we walked to our hotel from the boat. The room was very nice and the breakfast was great. We walked all over Bergen; it is a great city for walking. Thank you for helping me with the reservations. Great Job!